This view from the top of San Juan County Road 52 shows a shepherd's tent. Behind that is a view down the canyon. Here's the GPS track. The canyons were steep so there's some going/coming discrepancy, but it's not too bad. Everything centers on Gladstone. All three of these county roads begin at Gladstone. There’s not much at Gladstone right now—a few buildings associated with reclamation work. The next picture shows one set of buildings—not much going on! Not much happens in Gladstone. Here's one of two clusters of buildings. But Gladstone is the center of this set of county roads. Gladstone was once the site of a thriving town. You can reach it multiple ways. 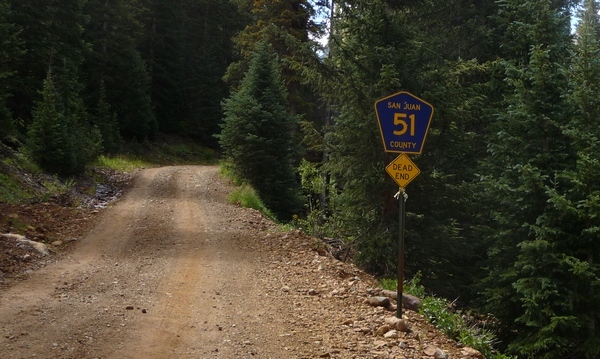 From Ouray County, go up over Corkscrew Pass and down to San Juan County Road 110A. Make a hard right turn (this is harder than it sounds, as the roads are quite steep). From there the road heads south until it reaches Gladstone, where it widens considerably and is well-maintained for any vehicle, not something that’s true north of Gladstone. 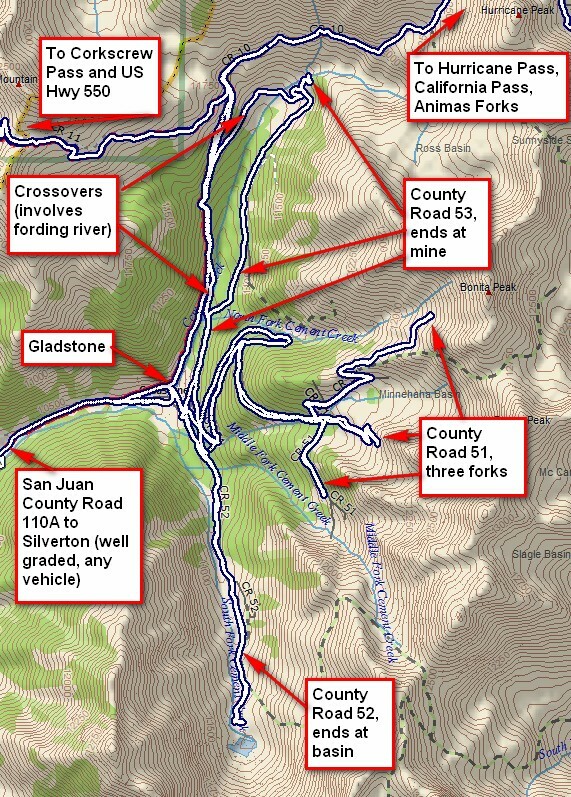 You can also get to Gladstone from Animas Forks by traveling west up California Gulch, over California Pass, over Hurricane Pass, and then travel on down to Gladstone. 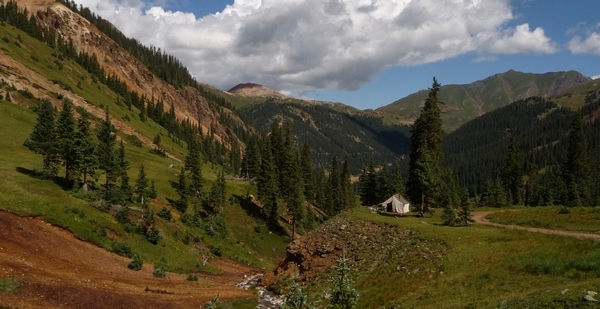 Another way, rather easier, is from Silverton. Just keep traveling north on the main drag—it turns into CR 110A. Here’s a picture of the foundation for an old mill. The mills were used to pre-process the ore, and the resulting higher-grade ore was moved by gravity to the next step. These mill-site ruins are in Gladstone. Best to observe from the road rather than try to climb through these. Once at Gladstone, you’ll immediately run into a problem. The bridge is out in a major way. No truck could get by this, plus the hole is deep enough it looks like further subsidence is on the way. Oops...major subsidence on the bridge knocks this one out. The road is blocked on both sides. You will need to detour south. So, how does one get across? Detour south a couple hundred yards and you’ll find a road that fords the creek. From there you can access the three county roads. I’ll take these roads from bottom to top, starting with CR 52. The road is in good shape and there’s not much scree. Spots are a little steep as they are on all these roads. The next picture give a good idea of the road base. Nice road, well-surfaced, leads into this beautiful basin. As noted in the first photo, sheep graze on the green grass—I waved at the shepherd. Given the recent rains, everything is green, green, green! These are only some of the sheep near the turnaround at the very top of the road. There’s a pool at the base of the high mountains—something common in many basins. I had to walk up the hillside a little to get this view. Here's the pool that forms at the bottom of the basin. Nice little natural alpine lake. It’s back down to Gladstone and then up CR 51. Again, this road is well-maintained with little scree. Unlike the other roads, this one leads up to homes that people have built on the old mining claims. There are three forks, all of which I traveled. The middle fork seemed to me to offer the most spectacular views. What a view! This looks way, way down into the canyon. You can see the tops of other mountains in the San Juan range. At the top of the north fork you’ll find more ruins. Here's a mine ruin at the end of the north fork. I didn't go all the way to the top of the road because I could see that it went to another ruin and ended. I like to keep the motorcycle away from these ruins—nails don't have to be new to puncture tires! Next we return again to Gladstone, then head north on County Road 53. This road essentially parallels CR 110A on the other side of the creek. 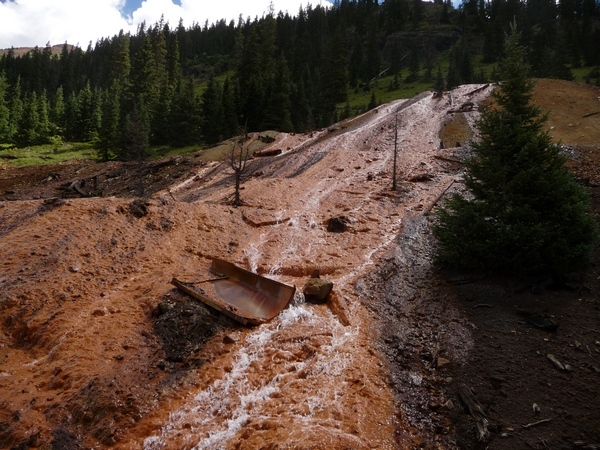 One of the first views is this reclaimer’s nightmare: an old mine gushing heavy-metal-laden water right down into the creek. Note the colors: these are left by the mineral-laden water, rich in heavy-metals. Don't drink this water! The sign for CR 53 says “dead end,” but this is not so. It climbs up the east side of the canyon, paralleling the creek. The result is more old mines, plus a couple that look like someone’s doing something with them. I actually took this picture from across the canyon, from a vantage point on CR 110A. I’d taken CR 53 up to the point where the scree got really bad, so I turned around. There’s a crossover point, requiring fording the creek, to get up to CR 110A. I wanted to see what lay beyond—the road didn’t go much further. I turned around about where the arrow points. I positioned myself up on County Road 110A to take this shot down at the end of CR 53. 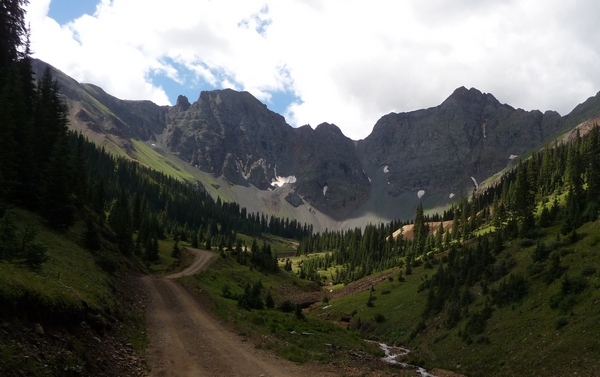 I stopped where the scree got bad, then crossed over the creek and up to CR 110A. There’s another crossover point as shown on the GPS track, which again requires fording the creek. All told, I spent a nice late morning wandering up and down these roads and taking pictures. I’d rate the whole experience as beginner++ due to some steep spots and a couple switchbacks.